We managed to travel by train for the first time on the trip (think now we've just about covered every mode of transport) to Orange to stay with my Ma's cousin Sarah. 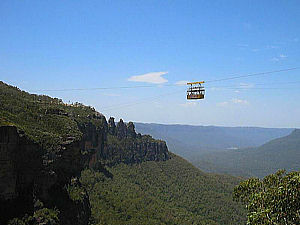 Its through the blue mountains so a pretty spectacular sight from the carriage at times. Orange looks a little like a US town (apparently a fair amount of inbreeding there too) and was bloody freezing!We had prepared for this with new jumpers, but the log fire was still a necessity much to Jack and Patrick's amusement. We had roast dinners and home comforts and a bath!!!! Some of the little things we had begun to miss! Was great to catch up with Sarah and meet the boys, watching them play rugby and taking a trip to the Blue Mountains and the aborigine legend of the 3 sisters. On the way to the Mountains in the car, Sarah nearly hit a cow in the road. It just stood there staring at us until she beeped her horn, where it did a little bit of a foxtrot and s*** itself before running off?much to our amusement. Simple minds eh? !It was nice just kicking back as the last few weeks have been a whirlwind.Then it was back again to Sydney for a few days before heading over to New Zealand for the last leg of the tour?.The end is too close!! !